Tired of waiting in line to check in at Selwyn? There now is another option! 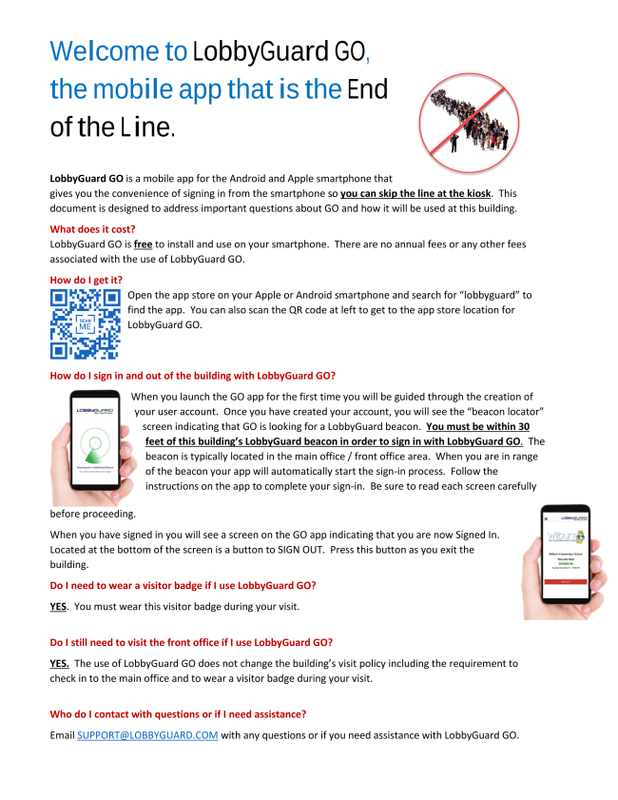 Download the LobbyGuard GO Mobile App and you can use it to sign into Selwyn from your smartphone. LobbyGuard GO puts all the features of the LobbyGuard kiosk in the palm of your hand, saving you time and reducing crowds at the front office. Available for Apple and Android - just search for LobbyGuard in the App store. When you have signed in you will see a screen on the GO app indicating that you are now signed in. Located at the bottom of the screen is a button to sign out. Press this button as you exit the building. You will still need to pick up your visitor badge in the front office, but it will be printed and waiting for you after you sign in through the app. Reference the LobbyGuard GO instructions for more information. 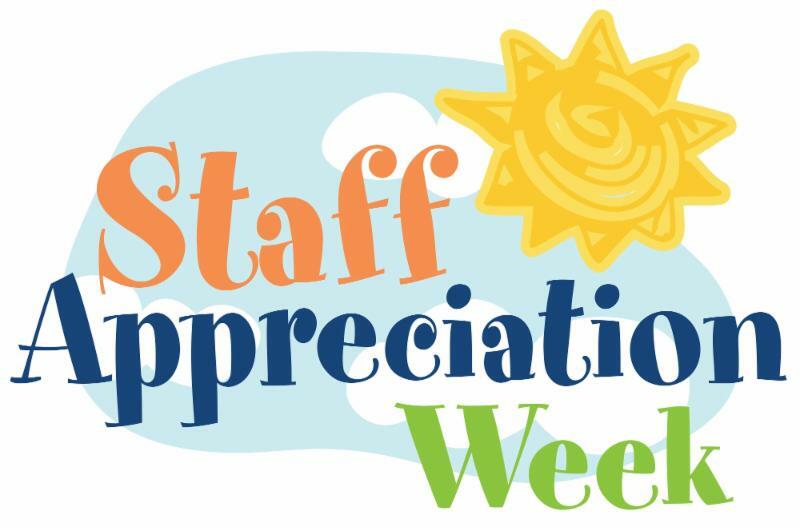 Let's Shower our Staff with Appreciation this Week! Please join us in celebrating our teachers and staff with festive treats and eats throughout the week. Monday: Breakfast catered by Poppy’s & afternoon snack bar in teacher's lounge. Tuesday: Bring your teacher a flower. Wednesday: Staff luncheon catered by Moe’s. Thursday: Wear your teacher's favorite color & teachers will receive a special school supply. Friday: Make a card for your Friday special area teacher & swag bags with gift cards distributed to all staff. Can you determine the right speed and distance to program a robotic ball to knock down bowling pins? How about building the fastest toy car out of pasta to measure the distance it can travel? These are just a few exciting STEM challenges the students will be participating in on STEM day! 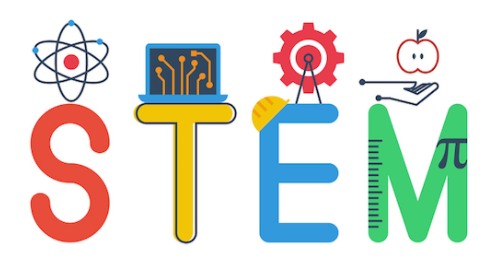 Students will collaborate in groups to complete four engaging STEM challenges to develop their problem solving abilities and critical thinking skills. Please come join the fun by assisting students with their STEM challenges on Wed Mar 20th. We need your help to make this possible! Please secure your spot here. Additionally, more toilet paper and paper towel rolls are still needed for the day. Please sign up if you have some to donate. Items are needed on or before March 18. March Madness is coming to Selwyn! 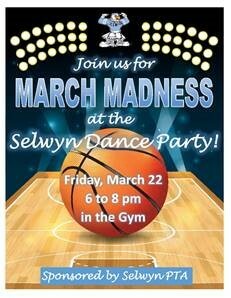 Bring your team spirit and fancy footwork to the SELWYN DANCE PARTY on Friday, March 22 from 6 to 8 pm in the Gym. Enjoy a DJ, treats, games and more! Feel free to wear your team’s colors or a jersey! RSVP by Wednesday, March 20 with the name of your oldest Selwyn student and the number of children and adults in your party. 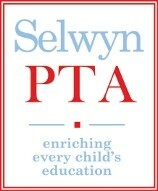 This event is limited to Selwyn students and their immediate family only. All children must be accompanied by an adult. See you there! On Friday, March 22 the Fourth Grade students will be making fleece blankets and sorting socks as part of an outreach project in support of Baby Bundles . Baby Bundles of North Carolina was founded by three local mothers to honor their own baby “angels”, and the organization provides a full bag of necessities to mothers in need as they leave the hospital with their newborn to help them begin parenthood on the right foot. NEW ITEMS: Clothes - newborn-12m onesies, sleepers, one-piece outfits and outfit sets; board books, developmental toys/ rattles/ teethers; socks, hats, blankets, bibs and burp cloths. Items are registered at Amazon under Baby Bundles. GENTLY USED ITEMS (no stains or major signs of wear): Clothes - newborn-12m onesies, sleepers, one-piece outfits and outfit sets; blankets. Please pin together any outfit sets and please no reference to holidays or family members on items. ALL DONATIONS ARE APPRECIATED. Baby Bundles bins will be placed in the Main Lobby as well as near the fourth grade classrooms. Questions? Please contact: Meredeth Murr. Join us on Sunday, April 7 from 2:00-4:00 pm for the Selwyn Sunday Funday! We will kick off the event with a 5 min FUN RUN/WALK. Families are encouraged to dress in their favorite costume or theme and the best/wildest dressed family will win a prize! 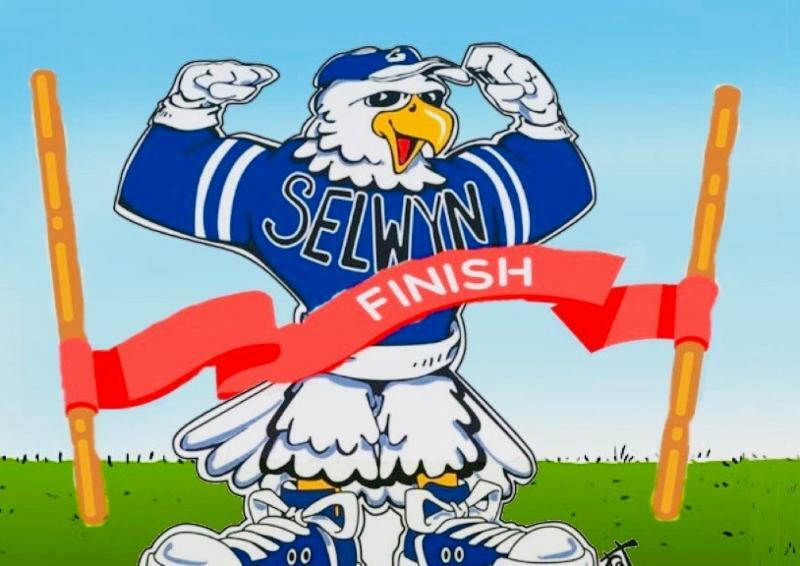 Attendants will have a chance to NAME the Selwyn Eagle. There will also be a dunk tank for those who wish to dunk some of their teachers! We will have fun activities for the whole family to enjoy and an assortment of community vendors. If you or someone you know would like to participate as a vendor please notify Coach K or 980-343-5835 by March 15. 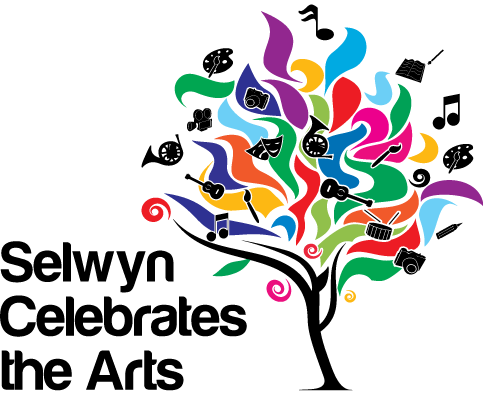 Selwyn Celebrates the Arts is fast approaching on May 2 . The school halls are transformed into a gallery of student artwork for the fun family event, and the SCARTS committee could use your help to prepare and hang artwork. Click here to sign up. Please contact Robyn Huffstetler or Kristi Warren with questions. All third, fourth, and fifth graders are invited to perform in the Performance Showcase at our annual “Selwyn Celebrates the Arts”. If you have been taking private music lessons and would like to showcase your hard work and talent, this is the event for you! The showcase will be held from 5:00-6:30 pm on Thursday, May 2. Due to other events this night, time is very limited for the solo performance showcase portion of “Selwyn Celebrates the Arts”. There are 36 slots available! All students will need to sign up for a specific time slot via this Sign-Up Genius. Sign-ups for time slots will be on a first-come, first-serve basis. The Sign-Up Genius will be open to sign up on Monday, March 11 at 5:30 pm. The Sign-Up Genius will be open until Friday, March 15 at 10:00 pm or until all slots have been filled. The Arts & Science Council (ASC) is seeking nominations for its annual Cato Excellence in Teaching Awards. These awards recognize exceptionally creative, innovative Pre-K – 12th grade Arts, Science, or History teachers as well as teachers who infuse the Arts, Sciences and History into the core curriculum. Nominations will be accepted until March 15, 2019, at 5 p.m.
Teachers, principals, school administrators, parents or students may nominate teachers for consideration. Six selected winners will each receive $1,500 and an original piece of art. The nomination form, eligibility requirements, and more details are available on the ASC website.